Dallas, from afar, seems like an enigma. Situated in the northeast of Texas, it has piney woods on the east; to the west, lies the vast expanse of prairie and desert for which Texas is usually known. However, Fort Worth, 30 miles west of Dallas, takes the strapline ‘Where the West Begins’ – so where does this leave Dallas? I had lived in Dallas for 15 years before moving back to the UK. December 1995 saw me spending the holiday season there, visiting wife’s family. We talked of what all had happened in Dallas since I had left, and I learned that an extraordinary new sculpture project had been installed in the south downtown area. An early afternoon found me with my reliable Kodak infra-red film and a 35mm lens on my Nikon roaming through the sculpture by Robert Summers. 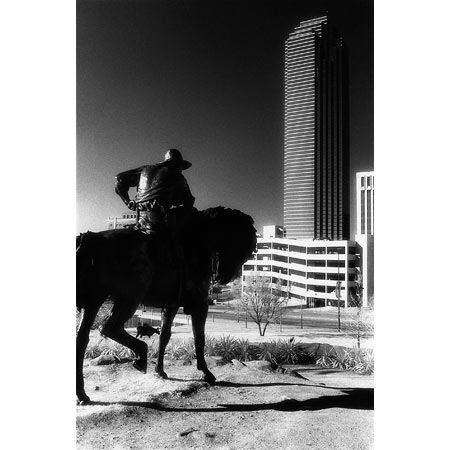 The amazing thing is that the sculptor didn’t just make one ‘representative’ piece to honour the cowboy ‘myth’ – but had created an entire life size herd of cattle and mounted cowboys – right in the middle of a teeming metropolis. Out of 20 or so frames, this is the image that captures what I feel is its essence – the cattle drive is coming over the last rise and the cowboy now knows he has reached his destination…Dallas! The stark clear sky and the monolithic beacon of the bank tower seem to be welcoming the cowboy home. Setting these components in the frame and positioning the distant cow, restricting the amount of buildings and ensuring no people or cars intervened in the mood - I remember was quite a difficult challenge. There is some detail in the horse, bouncing off the stark white soil, which has been burnt in during printing. I feel it is a very fluid and dramatic image of Dallas.